How often do we see greater flexibility for less cost? Well, our 3 point cam adapter offers just that. It converts a low cost single point cam into a cam for a 3 point rod locking system. This gives enclosure manufacturers a much reduced stock requirement for varying cabinet door sizes, typically leading to a 40% reduction in stock costs on this component type. OEM/Specialist cabinet producers often stock both single and 3 point cams, but now need only stock the popular and low cost single point item with a small quantity of adapters. The 1000 cam adapter is a precision zinc die component suitable for the complete range of EMKA 1000 ¼ turn locks where the standard single point cam is appropriate. 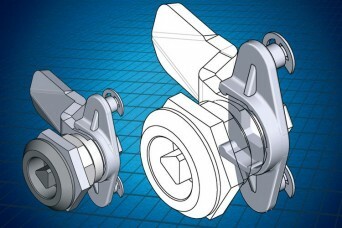 Fixing is a single bolt operation and may be carried out in cabinet manufacture, at installation, or as a retro-fit, by removing the cam fixing bolt and refitting, then installing the rod system to the door, thus providing two more closure points for improved sealing and security on longer doors. See here for details. Share the post "3 Point Cam Adapter reduces customer production costs……"